Our first, of hopefully many, author events was last month. Novelist, Maria Hudgins, came for the afternoon to discuss her books. She read a selection from one of her travel mysteries and took questions from the group. Mrs. Hudgins also gave us all some insight on the next book she will be writing. She will be traveling to England soon to do some first hand research on the setting and other historical details of her novel. We are very excited about our next author event. On Saturday June, 9th from 6pm to 8pm we will host J.D. Cunegan. Part murder mystery, part super hero, part sci-fi, J.D. writes in a new breakout genre! You will not want to miss hearing about the latest addition in his Jill Andersen series, or other fantasy adventures he has written. 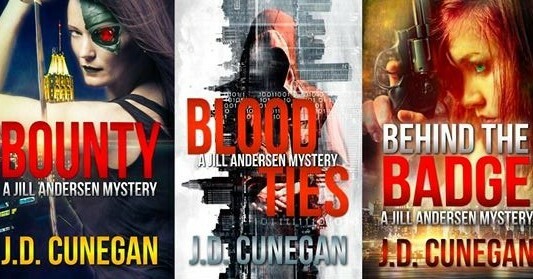 Visit his fan page here https://jdcuneganbooks.com/ and check out his work before you meet him next Saturday!